Mar & Bean: The BUZZ! Check The Early Mama's lovely little write on me! She like myself is a young mom, 25 with a two old...her blog focuses on the world of "early mamas" AKA young moms. 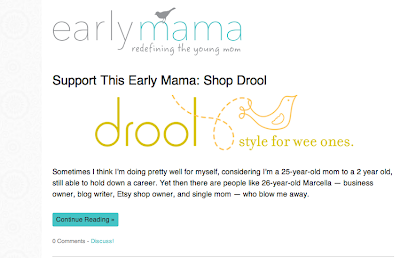 I admire her writing style, if your lookin for a new blog to add to your collection shes DEFINITELY one! heres a couple other blogs have I have been featured on in case you're interested!